A few weeks ago, the National Christian Elders Forum (NCEF) issued a statement titled THE NEED TO PRESERVE THE PEACE AND UNITY OF NIGERIA. 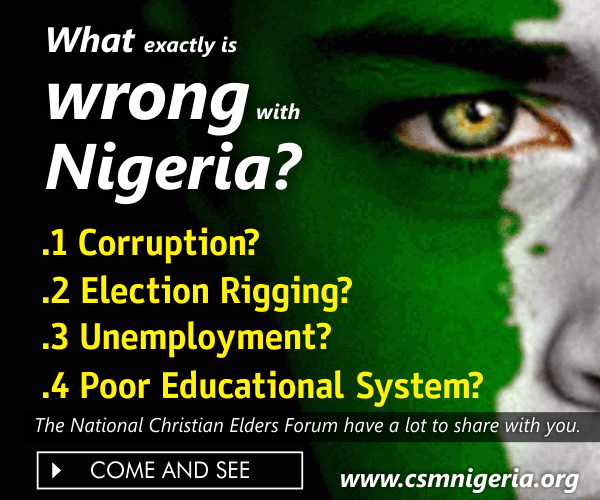 Of concern to the Christian Elders is the deteriorating state of national security, the free fall state of the economy, the inflammation of religious tension through the misappropriation of state powers, a worrisome foreign policy that is evidently skewed in favor of Islamization, as well as the increasing impunity of the Fulani herdsmen, amongst many other issues. 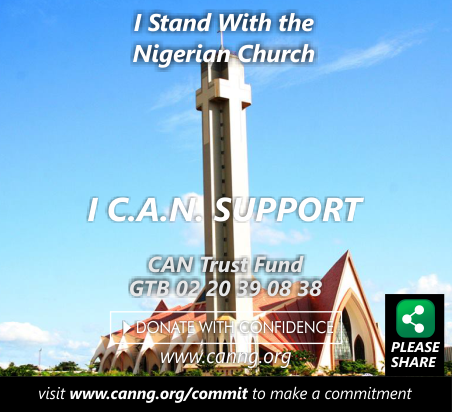 The National Christian Elders Forum was established by the Christian Association of Nigeria (CAN) to make statements in defense of Christianity in Nigeria, as well as promote peace and unity among Christians and Nigerians, as a whole. The NCEF is made up of Christian Elders from the six geo-political zones in the country. In retrospect, the amalgamation of 1914 produced a country but not a nation. There was an amalgamation of two Protectorates but there was no integration of the Ethnic Nationalities and this created serious fault lines that still exist today. The unity of the two protectorates was not part of the British Agenda. Rather, Britain sought to maintain a hold on Nigeria through a policy of divide and rule. In effect, Nigeria remains a country made up of two races pulling in opposite directions. There is the indigenous African race tilting towards a Westernized ideology and the Arab race, made up of Fulanis, Hausas, and Kanuris in favor of adopting the Arabian culture. At independence in 1960, the impression was created that “all” Nigerians opted for Liberal Democracy as the national ideology. As the years progressed, it became clear that some citizens of the Arab stock were more in favor of a system of rule of which an “important ingredient is the application of the Muslim Law”. While paying lip service to democracy, many of the political, religious, traditional and military leaders from the Muslim North were insidiously working to undermine democracy and promote Sharia, which is based on Islam and is patterned after the Arabian culture, to which the North has been exposed to for hundreds of years. Operating under the Islamic practice of “Taqiyya”, which permits a Muslim to deceive an “infidel” in order to gain the mastery over him, leaders of the Muslim North surreptitiously “smuggled” Nigeria into OIC in 1986 and kept it out of public knowledge for ten years until 1996, when Sultan Dasuki confirmed to the Pope that Nigeria is a member of OIC. The Islamization Agenda was solidified in the period 1975 – 1999 under the military rule, of which majority of the military heads of state were Muslims from the North. The Muslim Military leaders favored an Islamic model of ideology because it promoted dictatorship. They set up an “invisible” government which operates behind the scene in the Presidency and constantly undermines liberal democracy while promoting Sharia. The “invisible government” is still active till today. The invasion of the nation by Islamic terrorism and smuggling of Sharia into the 1999 Constitution, thereby creating a dual ideology for the nation, are reflections of the activities of the “invisible government”. Boko Haram, membership of Nigeria in OIC, Islam in Africa Organization, the D8 group, as well as compromise of Section 10 of the Constitution on separation of state and religion, are all interwoven conspiracies to abolish Liberal Democracy in Nigeria and declare Sharia as the national ideology and the nation as an Islamic state. Bearing in mind the huge ethnic, cultural, religious, and racial diversities in Nigeria, it was deemed necessary that an all accommodating ideology would be required to ensure justice, equality, and fairness for all the divergent groups in the nation. Unfortunately, a group known as “Islamists” has been working surreptitiously over the years to supplant Liberal Democracy with Sharia as the “source of legislation” in Nigeria, over and above the Constitution. The present day state of global Islam makes it imperative for a distinction to be made between Islam and Islamism. While Islam is a religion, Islamism, otherwise called “political Islam”, “is a set of ideologies that holds that Islam is not only a religion but a political system”. As a political system, Islamists insist that Islam is meant to dominate the environment in which it is practiced. In a sharply divergent society like Nigeria, any attempt to implement the principles of Islamism portends great danger for the nation. The various Military Governments of Nigeria, starting from the regime of Murtala Muhammed in 1975, did not hide their preference for the imposition of Islamism upon Nigeria. The Military changed the status of Nigeria and commenced attempts to make the nation an Islamic nation first by making it an OIC observer and thereafter to full membership of the Organization of Islamic Conference (OIC). Later, Nigeria was made a member of the Islamic D8. It is clear to the NCEF that since the amalgamation of 1914, the Islamists have been in control of northern Nigeria, while the majority of Christians were in the South. The military government of General Babangida merely extended Islamism to the South of Nigeria by Nigeria’s full membership in the OIC. Thus, in 1981 the race to make Nigeria an Islamic state was accelerated. Evidently, this ideological competition between Liberal Democracy and Islamism has not helped Nigeria concerning development, progress, peace and security and the reason can be found in the conclusions of several thinkers that Liberal Democracy and Sharia are not compatible. For Islamists of a radical disposition, like the influential Egyptian activist Sayyid Qutb, “democracy and Islam are simply incompatible”. The British, in their characteristic divide and rule policy, left Nigeria with democracy in the hands of Islamists, knowing full well that democracy and Islamism cannot peacefully co-habit. The challenge facing Nigeria today is how to resolve this apparent contradiction that has created a conflict of ideologies for the nation. If this trend continues, Nigeria is sadly being moved into an arc of conflict and that is why we are calling for a Truth and Reconciliation Commission to be established by law. It would appear that the Islamists, (otherwise known as the “invisible government”) who used to rule by proxy in all the previous administrations, are now fully entrenched in Government. Rather than pretend that all is well with the country, Nigeria needs to examine its past critically and reconcile all the ethnic, religious, and other groups in Nigeria. Presently, the Islamists control the Executive, Legislature and Judiciary. It is instructive to note that many Arab nations have found Islamism an extreme way of religious expression and have taken steps to ban it. Examples are Egypt and Tunisia. After the Arab Spring revolution, both nations voted Islamists into power and within a few months, staged another revolution to oust them. Even the United Arabs Emirates is on record to have denounced the extremism associated with Islamism when it alerted Britain on the dangers of giving oxygen to what Britain does not understand. It is therefore a cause for concern that in Nigeria, a multi cultural and multi religious nation, Islamism should be thriving. As a principle, Islamists “loathe” democracy believing that it is a “man-made” law that must give way for “God made” law, which is Sharia. Islamists, as opposed to Muslims that practice Islam as a religion, will go to every possible length to eradicate democracy in any society so that Sharia can be introduced. Nevertheless, Islamists pay lip service to democracy and claim to promote and support it. Nigerians should understand that such claims by Islamists of supporting democracy are mere pretensions and a display of “TAQIYYA” (deliberate deception) because they work surreptitiously underground to undermine and destroy democracy. In the build up to the 2015 elections, majority of Nigerians expressed great hope that there would be CHANGE in the nation. However, ten months after the new government was sworn into office, credible apprehension can be expressed given the policy direction of the new administration. We hope that the buildup to these policies do not result in full blown Sharia which President Muhammadu Buhari had promised Muslims in Nigeria. a) The apparent disregard for the Constitution, by Mr. President in many instances. For example, N900 billion was released in bailout package for states without Appropriation, the government was run for five months without a Cabinet, international commitment are being made without recourse to the National Assembly. All these are acts violating the Constitution. b) Including Nigeria in the Saudi Arabia Military Coalition of “Muslim/Arab” nations would appear that the Foreign Policy thrust of the present administration is to make Nigeria a satellite state of Saudi Arabia. The strengthening of the nation’s democracy and security for all should remain the greatest priority of Government. This we see to have been negated by the President’s fiat/unilateral decision to enlist Nigeria in the 34 nations Muslim/Arab coalition. Given the emotive and sensitive nature of this unilateral Executive decision, it should have been handled by Mr. President in line with our democratic culture through popular discussion and participation by the citizenry, or at the very least, through the National Assembly. c) Attempt to fund deficit in the 2016 Budget through issuance of Sukkuk loan which is a “Sharia compliant loan.” Nigeria is not a Sharia compliant nation. d) The consideration of establishing “free visa” arrangement with Islamic D8 nations. These countries are: Bangladesh, Egypt, Indonesia, Iran, Malaysia, Pakistan, Turkey, and of course, Nigeria. e) The apparent Islamization of key security positions in the country. f) The apparent disdain and contempt of Mr. President for Christians in Nigeria as demonstrated during his interview on Al – Jazeera on the objection of Christians to Nigeria’s involvement in the Saudi led Military Coalition to fight ISIS. We wish to remind Mr. President that he was brought to power through the votes of Nigerians, Christians inclusive. Mr. President should kindly remember that the over 50% non-Muslims in Nigeria did not vote for the nation to transmute into a Sharia compliant nation. Mr. President assured Nigerians that he is “a convert” to democracy but we are disturbed by the direction of his administration. We are aware that there are presently Islamists in Government prepared to execute the Islamization Agenda. Any nation in which Islamists believe that they are sufficiently strong to exercise influence rarely experience peaceful cohabitation amongst the divergent groups within it. This is the current situation in Afghanistan, Pakistan, Libya, Iraq, Syria, Yemen, Saudi Arabia, and the Sudan. Islamism thrives on injustice, inequality and unfairness. We urge Nigerians to remain circumspect so that the Islamists do not drag the nation down the path of destruction. We wish to express tremendous shock at the proposed Kaduna State Religious Bill. The proposed Bill contravenes Section 38 (1) of the 1999 Constitution. We should remind the Government of Kaduna State that religion is personal and no one has the right to legislate on how individuals worship. We call on the Kaduna State Governor to retrace his steps from this ill-advised venture. We are saddened by recent exposure in the country of serial cases of forceful abduction of underage, forceful marriage, marriage without parental consent of the Christian girls and their forceful conversion to Islam. We condemn in totality this act of violation of the Human Rights of these girls and it is a degradation of our national values. We are also amazed that the Senate failed to pass the Gender and Equal Opportunity Bill into law. We strongly recommend that this Bill should be re-introduced and passed into law urgently. We are dismayed by the inaction of the Federal Government to the carnage and destruction caused by the Fulani herdsmen against legitimate native land owners and farmers, across the country. The most recent case occurred in Agatu area of Benue State in February 2016. According to media report by eye witnesses, over 300 Nigerians were allegedly massacred by the herdsmen and many communities were devastated in the attacks. It is most shocking that till today, there has been no prosecution of any of these marauders. For years, the Fulani herdsmen have been murdering innocent Nigerians with impunity. The murderous escapades of the Fulani herdsmen has gained international notoriety to the extent that the group is now considered, internationally, as the fourth most dangerous terror organization in the world. It is sad to note that Boko Haram, which is presently regarded as the world number one most dangerous terror organization and the Fulani herdsmen, considered the fourth are both operating in Nigeria. Meanwhile, the response of Government to the menace of the Fulani herdsmen has to date, been tepid and indifferent. One reason adduced to justify the perennial attacks of the Fulani herdsmen is the argument that they seek grazing fields for their cattle and as a result engage in conflicts with farmers. It was therefore proposed that ancestral lands of other ethnic groups should be allocated to them as grazing fields. However, the most sensible and economically wise approach would be to build ranches for the herdsmen in their states of origin. This makes more sense and it is the internationally approved best practice under the circumstances. Other nations of the world consume beef yet, nomads do not drive herds of cattle all over the nation in the 21st century. The Grazing Reserve proposal is seen as a deceptive manner of appropriating the lands of indigenous ethnic groups for the Fulani herdsmen to spread their tentacles of terror all over the nation. The proposal should be dropped and the state governments of the herdsmen should build ranches for them in their states of origin. We find it curious that the Federal Government of Nigeria that has pledged total support for a two state solution to the Israel – Palestinian conflict, as well as support for the Sahrawi Arab Democratic Republic (SADR), is not addressing the demand of the Indigenous People of Biafra (IPOB) for a state of their own. To date, the leader of IPOB, Mr. Nnamdi Kanu is still under detention while there are frequent killings of the protesting members of the Movement. The latest in the series of attacks on the IPOB occurred on 9th February, 2016 when over twenty two members of the Movement were killed by soldiers during a prayer meeting in Aba. It is difficult to rationalize why a government that is clamping down on agitations for self determination by an ethnic group within Nigeria, could be supporting such agitations in foreign countries. We recommend to the Government that as it is considering the case of SADR and the Palestinians, it should in like manner open dialogue with IPOB. The solution to the Biafra agitation is dialogue. While we discountenance any secessionist move, the solution to the Biafran agitation is dialogue. a) Government should urgently convene a Council of State meeting to enable past presidents assess developments in the nation and give mature counsel. i. To distinguish the differences between Islam and Islamism and identify Nigerians that promoted Islamism in Nigeria. ii. The role that Islamism played in promoting corruption and impunity, which includes cultism, a phenomenon that was developed in Nigeria in the last 30 years. iii. Identify the role played by the armed forces, the police, and the intelligence agencies in the promotion of cultism, corruption and other vices that have since devastated Nigeria. iv. To grant reprieve and pardon to any person, organization or group which confess to criminal, illegal and immoral act in the past. v. To deal with the issues of genocide and/or marginalization perpetrated against certain ethnic minorities and promote reconciliation and healing to all those affected. c) Every form of negotiation to involve Nigeria in issuing Sukkuk should be discontinued. Sukkuk is a “Sharia Compliant Loan” which does not serve the interest of all Nigeria because the nation is not a Sharia compliant nation. In addition, Sukkuk would jeopardize the sovereignty of Nigeria because under Sukkuk, both the lender and the debtor will own the asset which is based on land. It therefore implies that if Nigeria should eventually succumb to the acceptance of the Sukkuk loan, both the Arabs and Nigerians will own Nigeria. d) To put an end to the murderous attacks of Fulani herdsmen, ranches should be established in the states of origin of the herdsmen. The Grazing Reserve proposal is seen as a deceptive manner of appropriating the lands of indigenous ethnic groups for the Fulani herdsmen to spread their tentacles of terror all over the nation. e) The ownership of Nigeria can rightly be claimed by the Ethnic Nationalities. We call on the President of the Federal Republic of Nigeria to complement the stand of the National Assembly on the Constitution and implement the Report of the National Conference as regards the Executive and Policy recommendations. The National Conference Report guarantees the introduction of true Federalism which is required to build a strong, united, and prosperous nation. f) In view of the security challenges facing the nation, it is highly advisable that each ethnic group should develop Community Policing to protect its people and its land. The security agencies have not been effective in providing security, particularly for vulnerable communities in the nation. g) For reasons shrouded in mystery, the government stopped the teaching of History as a subject in schools. From the experience of Black Africans in Sudan, Islamists employ this sly method to eradicate the history of the indigenous ethnic groups whose land the Arabs covet and wish to takeover. According to George Orwell, “The most effective way to destroy people is to deny and obliterate their own understanding of their history.” A people without history, is a people without a future. We therefore demand that the teaching of History as a subject in schools should be reintroduced forthwith.